What's more entertaining than two puppies chasing each other around the backyard, frolicking in the dry summer grass and nipping at each others knees and tails? Nothing. Nothing is more entertaining than that. BUT! There is something shiny on the blog tonight from Born Pretty Store. It's called "Dazzling Starry Foil", and it's...well...dazzling. It comes in a long continuous strip of really thin delicate foil that transitions from fuchsia to a hot orange-red. It comes in lots of varieties of colors, but that's the color I was sent for review. If you know your color wheel, then you know that purple and yellow complement each other, and since this was leaning more on hot purple, I paired it with the yellow Happy Go Lucky (China Glaze). It seemed a little bare like that, so I added stripes. Now it feels kind of Andy Warhol/Betsey Johnson. Neat right? The foil is really simple to use, but it took some practice to get it right. The technique best used is to paint your color and design on and seal it with a layer of top coat. Let that dry fully. Then, add another layer of topcoat, and when it's about 80% dry, grab your foil. Press it firmly onto your tacky top coat, and rub it with a pretty good amount of pressure. 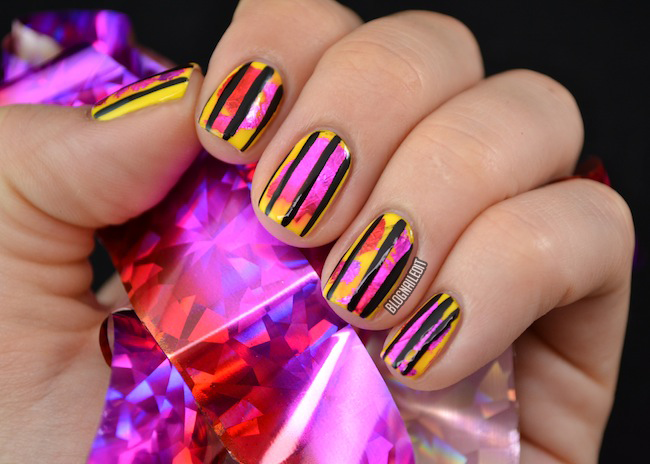 This will transfer the foil onto your nail in random splotches. I don't know of a way to create uniform patches yet. It's also important that when you do this, you have the colorful side up, facing you. This role can be purchased for $2.99 from Born Pretty Store here. Get 10% off that order with my coupon code C10X31. These products were sent to me by Born Pretty Store. The reviews are based entirely on my experience with the products and were in no way influenced by anyone. Love the brightness of this! SO pretty. They make a special adhesive for nail foils and you can paint your entire nail with it, wait for it to turn clear and then firmly press the foil all over the nail. Alternatively perhaps PVA glue would work similar. Just a hunch. I really like this look it is so pretty! This is such an awesome look! So beautiful! :D It kinda looks like flowers underneath the stripes.. It does look good together!